Michael Reyes is a current student at San Diego State University where he studies Jazz and Music Education. His primary instrument is guitar but he also has experience with other instruments including the Trombone, Trumpet, Piano and Voice. He has been in the Chamber Choir, Aztec Choir, Symphonic Band, the Jazz Combo II and he is also a member of the Performing Arts Troupe, a community outreach performance for children and families. Michael hopes to be a future music educator in the public schools, particularly in the Middle or High School range. Mr. Reyes will be competing his SDSU Music Education Fellowship at Correia Middle School where he will be mentored by Mr. Dwyer and work with our talented students several hours a week throughout the semester. Shannon is a college student studying music and education. She works and coaches with the music programs at Correia Middle school, Point Loma High School and University City High School. 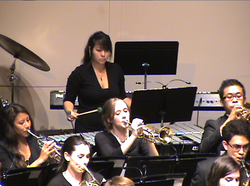 Shannon is a percussionist in the Point Loma Nazarene University concert band and performs in the pit orchestra for various musical productions. She is a well sought-after freelance percussionist in the San Diego Area.